If you had to pick the top affordable sport sedan or coupe of the early 1990s, where would you land? Despite the general feeling that 1990 was on the tail end of the malaise era, with affordable cars like Toyota’s Tercel doing nothing to dispel that notion, there were good choices from each major region – America with cars like the Ford Probe GT and various captive imports, Asia (mostly Japan at this point) with Nissan’s 240SX and Toyota’s 4AGE-powered cars, and Europe with, uh, Yugo’s GVX? Well, the one that probably really stands out for most of you is the Nissan Sentra SE-R, widely compared to the BMW 2002 and by extension, the Datsun 510. But that’s a shame, because it meant the excellent VW Jetta GLI was in its shadow, with a sweet 16-valve engine, sure-footed handling, and period-typical design cues like BBS wheels, Recaro seats, and a body kit with spoilers and fender flares. 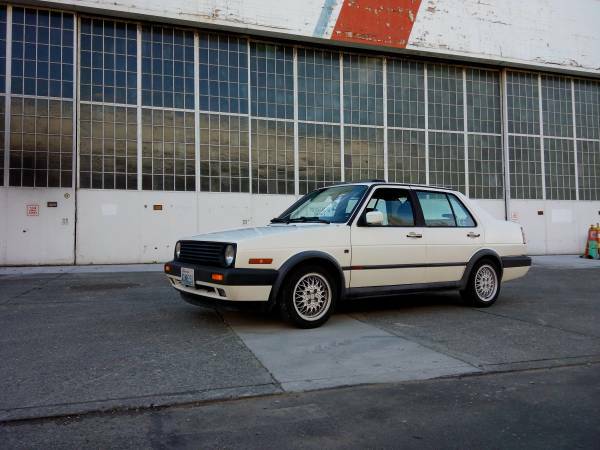 Let’s have a look at this 1990 Volkswagen Jetta GLI for sale for $2350 in San Jose, CA. So you want a nimble, light sports sedan that’s not heavy with power windows and seats, airbags and other safety nonsense, and a good driver 2002 has moved out of range? All is not lost, by far. Twenty years after the 2002 went out of production, you could get quite a few sporty sedans that were relatively light, similarly quick, and fun to drive, with technology that was not available on the 2002 – things like electronic fuel injection and four-valve-per-cylinder heads, plus you might get somewhat better handling in poor conditions. Check out this 1992 Volkswagen Jetta GLI for sale for $3000 in Edmonds, WA.